"Everyone has blind spots," goes an extremely accurate quote from The IT Crowd. Growing up, I not only didn't hear music like The Beatles and...other groups I don't even know the names of, because non-musical theatre music is beyond my abilities, but I don't remember hearing any bands at all. All my knowledge of what was popular at the time came from the Wayne's World series (particularly the second since it has that concert where people seemed to be really excited about this band Aerosmith), and from my oldest brother. He had all the CDs. I didn't listen to them, but I knew names like Pearl Jam, En Vogue, Salt-n-Pepa, Blues Traveler, and R.E.M. because of him. He gave me my first CD — a discarded Janet Jackson single of his called "If" which has FILTHY lyrics that you fortunately can't understand at all. Fortunately because I was eight and it became my favorite song. This lack of knowledge came about because growing up, my mother would play musical theatre tapes. All the time. My brothers still know all the songs from The King and I, however much they might want to forget them. A few years ago, I said "Your servant, your servant/Indeed I'm not your servant" and my middle brother, against his very will answered "Although you give me less than servant's pay." This is what we grew up with. Well, this and the Time Life Fabulous Fifties collection, so we're also very up on the lyrics to Sh-Boom. Those surveys that would go around LiveJournal and email circles back in the early days of the internet would inevitably ask your favorite band, and I would invariably answer "Beverly Sills," because I liked NO BANDS. 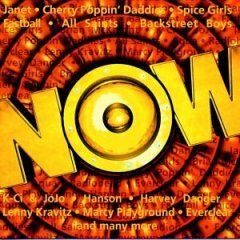 I felt it was cheating to name someone on my Now That's What I Call Music CD since I only knew that one song of theirs that was super-popular. My first exposure to the world outside musical theatre and opera came from VH1's Top Ten Countdown, where VH1 would play the music videos for the top 10 songs of the week. I watched it every time it aired, because My Heart Will Go On was in the top ten, and say what you will about Titanic, but I. LOVE. that song. I love it so much that as I was writing this, I had to listen to it again and stopped to lipsync to the part (you know which one) where it's all *silence* BOOM "YOOOU'RE HEEEERE/THERE'S NOOOOTHIIIING I FEAR." Like you can just let that happen with no participation. The other songs in the top 10 at the time were stellar bastions of 1998 culture. Oh, let me tell you a tale of old and bring to mind such classics as Matchbox 20's 3 AM, Together Again by Janet Jackson, Savage Garden's Truly Madly Deeply, SMASH MOUTH and Walkin On the Sun, Madonna's Frozen, Natalie Imbruglia wailing the anemic voice of the late '90s girl in Torn, Lisa Loeb bringing in cool nerd girl in I Do, Sugar Ray's Fly which sounds like nothing if not the late '90s in musical form, and of course, the completely stupid Are You Jimmy Ray. I am only now, with the advent of Spotify (the app I love more than all other apps), listening to bands. Bands everyone else just kind of seems to know. I still don't like The Beatles, mainly because I didn't have a teenage love of them and so now I'm just annoyed by how much everyone seems to like them and hold them above all other bands when they just have some catchy songs and yeah, Let It Be is real damn great, but so is Britney Spears's Where Are You Now. I'm learning about this "The Clash" and Peter, Paul and Mary, and I will eventually have an opinion on Radiohead. I cannot currently name any of their songs, but it'll happen eventually. People keep making me playlists, so...hope springs eternal. And at least I don't have to ask people if boy bands count as bands anymore.